The 'South Ward' and ‘North Ward’ both housed SelClene’s Call Centre, once employing as many as 16 staff. The North Ward is shown with desks set up ready for the call centre to move from London - the office chairs had not yet arrived in this picture. The SelClene cleaning agency operation has now been downsized to 1 member of staff in a small office, as it went into decline after 2007/8. For a while the old 'North Ward' fell out of use, but was then revived to become the wedding planning office. It has been split in two with half used for storage (junk in the main!) and half becoming the wedding planners office. We employ 4-5 full time wedding planners now, instead of 16 cleaning agency call centre staff. 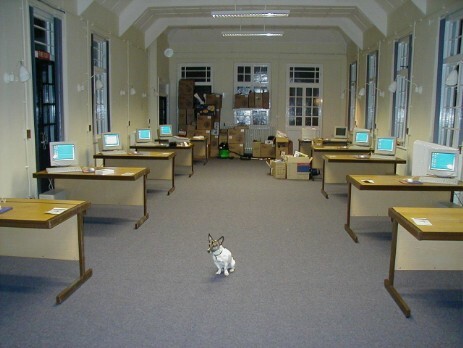 The office area was the first section of the Castle to be refurbished and work commenced early in 2000, as we had to make space for the call centre as it moved from London. So we got started on this area even before we 'completed' on the purchase of the castle. Painters moved in and spent a month painting the North and South Wards inside and out. This building has loads of windows so took a lot of re-grouting and painting work. Shortly after completion, carpets were fitted, windows repaired, the original hospital lights re-wired for posterity and office standard strip lights hung from the tall ceilings, telephones and computers installed. Even the old hospital heating system was reinstated with the help of the previous owner, Dr. Jones. The old plumbing is still in use today, though with new boilers. 17 years on, this area needs repainting badly externally, though the interior has had a make-over in 2012. Several of the doors need replacing with new specially made doors in the style of the originals. It does not look as if we will take this building down and do the new-build we had planned, for the foreseeable future. There are two wings - the North Ward (with desks) is shown in the top picture and is still in use as an office. 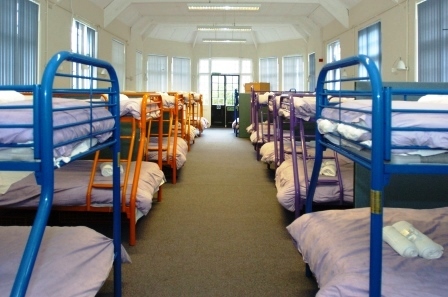 The South Ward (with bunk beds) is shown in the lower picture. Both wings have all their original hospital era bedlights still working (re-wired by us). The South Ward however has fallen out of use as a dormitory - there's now no demand for this style of low budget accommodation - and so (like any unused area in the castle) has become a junk and storage area. Ideally we need to find a new use for the 'South Ward' - so are open to alternatives in the future once we can find somewhere for all the stuff stored there.